An interesting news article crossed my desk recently. It was about the Damilic Corp. from Rockville, Maryland and their Autopen. One of the best-kept secrets in Washington is the fact that many of those presidential signatures that have been tucked away in scrapbooks and proudly framed for all to see, may not be actually signed by the president. In 1803 John Isaac Hawkins patented the Autopen in the United States and a year later Thomas Jefferson began using it. For decades American presidents from both parties have used the Autopen to sign the hundreds if not thousands of documents requiring president signatures. This latest article was newsworthy because the Autopen was used for the first time to sign a bill into law. Since President Obama was out of the country and the bill needed signing the Autopen was used. Some politicians raised questions as to where Obama's use of the Autopen met the Constitutional requirement for signing a bill into law. The photograph of the Autopen in the news article shows an old-timey looking device with signature templates that fit into the machine. It is said that Ronald Regan had twenty-two templates with different signatures. Of course presidents are not the only people using the Autopen; there are companies that use it to reproduce celebrity autographs on photographs and more. This story about the Autopen got me to thinking about signatures in the tattoo business. 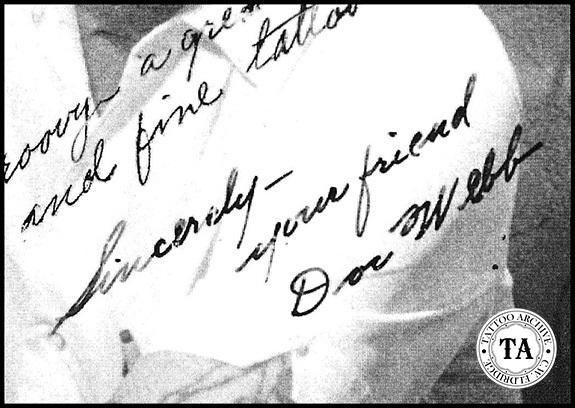 Signatures are one of the tattoo collectibles that are all but disappearing in our modern computer age. They could be found on letters or other personal correspondence, on the backs of photographs, etc. But today with email and digital photos, we are losing these chances to get a personal signature. The good news is that if you have a Charlie Wagner, Percy Waters, or even a Mildred Hull autograph, I would say that you could rest assured that it is the real deal and not done with an Autopen. 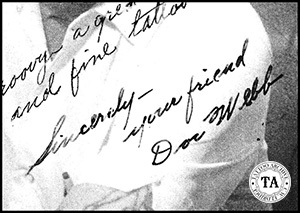 A few classic signatures from the tattoo world are included with this article.